For the past fifteen years or so I’ve been providing illustrations for a syndicated column called Sew Simple. When I started the feature it was written by Eunice Farmer, now it’s done by her daughter, Vicki Farmer Ellis. 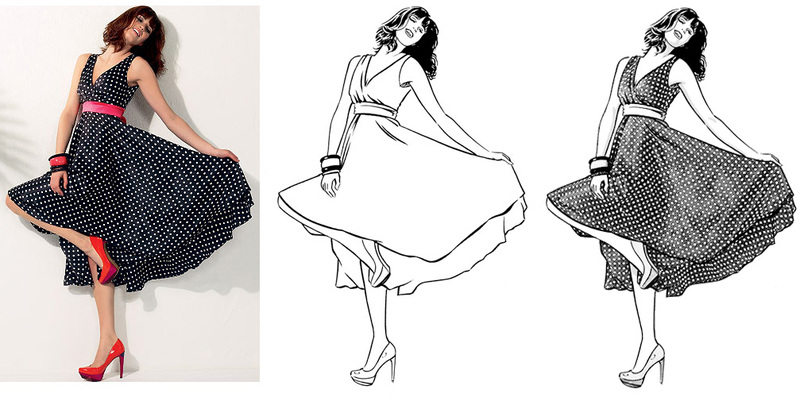 Basically what’s needed is a black and white drawing created from a color illustration or photo. Over the years I combined the traditional pen and ink with digital to produce the work. Close-up of artwork to show detail. The general steps involved in creating the artwork starts with making a non-repro blue copy of the reference to ink over, thus creating the line art. I could have done it all digitally by creating the line art using a Wacom tablet, but I still prefer the line I get with a traditional dip pen. After the line art is done, I’d then manipulate the reference to create certain tones in Photoshop, or just lay in a tone in grayscale. The last step would be to bitmap the image. Creating a non-repro blue image. Line art followed by tone. The mixing of pen and ink and digital can be tricky as you don’t want the combination to be jarring to the eye. The pen and ink has to be up to a photo realistic level and the digital adjusted so it is in harmony with the pen and ink. Here’s some examples. I’m posting these as the print date of February 3, 2013 wraps up my tenure on the feature (had to pass on renewing my contract due to time constraints I had involving other work). A lot of work freelancers do is uncredited, so I hope you enjoyed the little peak inside the process of a syndicated feature. This entry was posted in King Features and tagged King Features, Sew Simple. Bookmark the permalink. FYI: Sew Simple dropped illustrations altogether early this year because of declining client papers. I drew the illustrations for close to 5 years, and your method worked great. The only change I made was to print out the photo in full color and ink it on a vellum overlay using a light box, just my preference. Initially I drew hard edged grays with the pencil tool for the un-cast shadows on the skin tones, but soon realized that if I blurred them, when converted to line art, the resulting lines would then taper, giving them a more feathered look that better indicated form. It looks like you already did this from what I can tell. Thanks for all your help early on, and I enjoy reading your blog! When I saw first illustration I thought of Leonard Starr and Mary Perkins. David – The torch has been passed!